His deputies “can’t wait” for the new jail to open in early 2014, Gusman said. 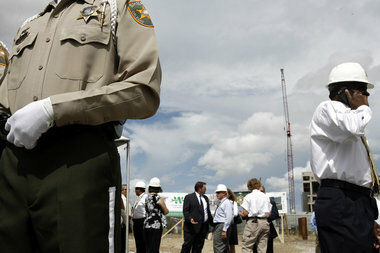 The 433,409-square-foot facility includes an inmate-processing and booking center, two courtrooms, a medical screening area, a property room and a vehicle-size “sallyport” entrance on the first floor so that officers can more easily transfer suspects from police cars to the sheriff’s custody. Sallyport entrances typically have a set of locked double gates and allow only one gate to open at a time. “This is big,” said Gusman, as he looked across the site toward a sign where renderings showed a gleaming, modern new jail building. In the other direction, he saw a grouping of temporary white tents that now house prisoners. In a few years, he will take down the tents to make way for the new jail’s front steps and parking lot, Gusman said. Landrieu boasted that the new jail will do more “than just house people” and touted the array of services and training that will be available to inmates, giving them a more seamless re-entry back to the world of employment with less likelihood that they’ll return to jail. “Your city is on a roll,” said Landrieu, who uttered that same sentence an hour earlier at a ceremony marking a $30.5 million federal grant given to the city to redo the Iberville public housing complex. The $145 million, four-story jail will be constructed on an empty parcel in the 2900 block of Perdido Street, where the Templeman Lumber Co. once stood and where in 1995 and 1996, former Sheriff Charles Foti built two lockups known as Templeman III and IV. Together, the two buildings held 1,438 inmates and were part of Foti’s massive, 12-building, 7,520-bed jail complex until they were critically damaged by flooding from the levee breaks in 2005 and demolished in 2007. Gusman’s current 3,227-bed complex of storm-damaged buildings stands between Tulane Avenue and Interstate 10 in Mid-City. On Thursday, he said, the inmate population stood at 3,000, roughly 800 of them state prisoners kept as part of an arrangement with the state Department of Corrections. The state pays “rent” to local sheriffs, who keep about half of all state prisoners.